The shade levels Playtonic have used made me gagged! I've waited years for this. Can't wait for this to be released. It's been a long time coming. I'm gonna miss the Bear and the Bird, but the Chameleon and Bat seem like they have it together. Gamescom 2016 Trailer for Yooka-Layee! The music may be very familiar to you all! This week we've dispatched our most frankfurter-resistant team members to the Gamescom expo in Germany. As well as teasing some of the new enemies, moves and mechanics you can see in our latest video, we offered Cologne-dwelling press the opportunity to play Yooka-Laylee for the first time. Media were invited to sample a version of the game's first world, Tribalstack Tropics, slightly edited for spoiler content and overly-lethal puns, and you'll begin seeing hands-on reports on your favourite outlets from today. Very soon we'll reveal our plans for how we'll be making similar invitations to the wider world. Stay tuned. Of course many of you will have already been sampling our game mechanics via the Kickstarter backer-exclusive Toybox, the response to which has been nothing less than fantastic. The Playtonic team wants to thank everyone who's played the Toybox so far for all of your valuable viewpoints. The team has been closely following your comments, videos and streams and you can rest assured we'll be looking to improve the final game based on your responses. Though we're still not putting pants on the lizard. Development is entering the polish stage and we're working our hardest to make the game as sparkly as possible in time for release day early next year. 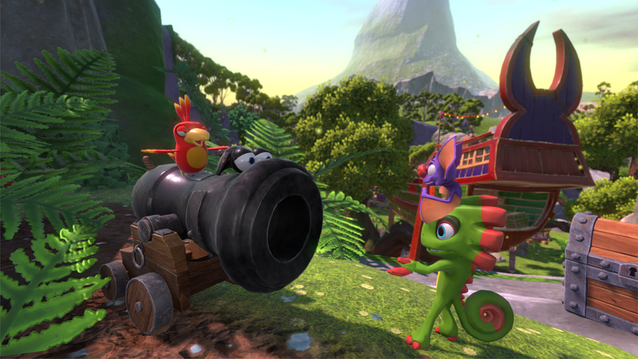 Look out for more Yooka-Laylee content reveals in the coming months. Thanks for your support! Looking better and better each trailer. I agree on the fact that it needs some polish though. Shovel Knight is confirmed to appear in the game! Not only that, but Yooka-Laylee is getting a physical release! Will get the physical version of Wii U, though by the time the game is out, Wii U is completely dead. Will it be for NX or PS4? I really don't want to invest in another Nintendo console. Actually, Playtonic hasn't yet specified which platforms will be getting a physical release. And likely Wii U, PS4, and Xbox One. Playtonic has no plans on making an NX version, so no, no physical release for NX. So instead of Wii U, I'll be getting the Switch physical version, that is, if I get the Switch. Awww, what a shame. I'm not really mad though, since I heard that Unity sux on Wii U from what Emily Rogers said on Twitter. Will look forward to the Switch release, the Switch could use its support in it's early years. You can get a refund for your donation to the game if you donated to the Wii U version, check playtonic games's website for more details.